Over the past several months, I have been working on what has become the PrayBox project. Originally, my vision was that it would become an anonymous prayer request exchange network and that it would attract prayer warriors who were interested in the business of lifting up the needs of others to the Author of Creation. Eventually, it became clear that this application would be better implemented as an application used by churches, ministries, and other faith-based organizations to build community and increase the opportunity for outreach. Today, as I’ve been reading through emails I have received over the past few months, I have been overcome by humility, realizing that the inspiration that came to me so many months ago and the hard work that I have put into developing this tool have been used to touch lives and serve ministries across the planet. Praise God for his faithfulness and willingness to use His people to fulfill his plans! The answer is Yes. Let’s begin with two statements in the Bible in John 14:6 and Acts 4:12. The Bible teaches that there is no other way to salvation than through Jesus Christ. Sin is anything that fails to meet God’s perfect standard. It is sin that separates us from God. The wages of sin is death (Rom 6:23). Jesus died for sinners on the cross, was buried, and rose from the dead (1 Cor. 15:1-4) His death was a sacrifice that turns away the wrath of God (1 John 2:2). This is the only way to be saved. Forgiveness of sins is only possible through the shed blood of Christ. You may be religious, but religion can’t save you. You must trust Lord Jesus what he has done for you on the cross, and ask Him to forgive you of your sins and be your Savior, then you are saved. I know I’m a sinner, and I ask for your forgiveness. I believe that Jesus Christ died for my sin and that You has been raised from the death. I want to trust You as my Savior and follow You as Lord. On December 25, Christians around the world will gather to celebrate Jesus’ birth. Ironically, at most Christmas the person whose birthday we’re supposed to be celebrating is completely ignored. He’s never even mentioned. Although Jesus is the reason for the celebration, he’s often overlooked or merely mentioned along with Rudolph, Frosty the Snowman, Santa Claus, the Grinch, elves, and a long list of celebrated fictional characters. The greedy business world has commercialized Christmas into a time of making billions-of-dollars. Christmas is now about buying, giving and receiving and only an occasion for family gatherings and parties. We spend much money on buying new things and get-togethers. Many people simply refuse to believe in Jesus Christ. Thus, we celebrate Christmas Christ’s birth into the world. If you’ve been missing the meaning of Christmas in your life, know that if you receive the Lord Jesus Christ and believe in His name, Christmas will become real to you. Believe! Trust in Jesus! Rely on Him for your salvation. Allow God to turn you from sin to forgiveness and salvation. It can happen today; and it’s between you and God. Some people ask the question: What is new birth? or to be born again? Jesus made this statement to a man named Nicodemus who was the great religious leaders of his time. Nicodemus came to ask Jesus questions about Kingdom of God. Jesus told him that the way to enter the Kingdom of God was to be born again. This doesn’t mean you can get back inside your mom to be born again! To understand what it means to be born-again, it is necessary to understand that there are two births. The “first” birth is the physical birth when you were born into this world from your mother and father. And The “second” birth is the spiritual birth. Being born “from above” or being “born again” as a Spiritual re-birth. By repenting of sin. That means we are willing to receive Jesus Christ as our Lord and Master and Savior. Sinners are spiritually “dead”; when they receive spiritual life through faith in Christ, the Bible likens it to a rebirth. Only those who are born again have their sins forgiven and have a relationship with God. Jesus, I admit that I am a sinner and I am sorry for my sins and the life that I have lived. Thank You for dying on the cross to pay the penalty for my sin. I now receive You as my Savior and Lord. Take control of my life and make me the kind of person You want me to be. In Jesus’ name I pray. Amen. God didn’t just come, check things out, and then return to his place. He lived among us, placing Himself under the conditions, sufferings, and temptations we all live with. He came to us in the person we know as Jesus Christ. He must die to save us from the penalty of sin (and from the power of sin). That shows how seriously God takes sin. What is your response to that claim and to the evidence that He is God and is the only saviour? Have you ever really believed in Jesus Christ? The only one who can answer that question is you yourself. True faith involves believing something about yourself: that you are a sinner and the wages of sin is death. It involves believing that Christ is the Son of God. It includes believing that He died for us on the cross and paid the penalty for our sins. It isan act of the mind. It is an act of the will. But it is also an act of the heart. If you have not already made the choice, now is a good time to respond to His sacrificial love with faith and accepted His invitation to everlasting life, forgiveness and peace. Believe! Trust in Jesus! Rely on Him for your salvation. “Believe in the Lord Jesus, and you will be saved” (Acts 16:31b). But If you have not repented of your sins and believed Jesus as your Lord and Savior, then you are in trouble. If you die in your sins, never repenting, you will go to hell and will be lost forever. Why Should We Believe in the Bible? 1. Despite having been written over a span of 1,000 years, the Bible possesses a unique continuity: The Bible, a collection of 66 different books, was written by approximately 40 writers of different backgrounds and professions. Although these works were written independently, they show an amazing congruency and they never contradict each other. There is one central message consistently carried by all 40 writers of the Bible: To tell us who God is, who Jesus Christ is and to show us how we can be saved from our sins and attain eternity. 2. The Bible is the only book which contains absolutely fulfilled prophecies. There are over 30 other religious books that people of faith believe are divinely inspired. Of these books, none of them contain any specific, trustworthy prophecies. None. These are just a few of the prophecies related to the coming of the Messiah. For example, the Old Testament prophesied that “The virgin will be with child and will give birth to a son, and will call him Immanuel” (Isaiah 7:14), and “He would be born in Bethlehem” (Micah 5:2). And in the New Testament “This is how the birth of Jesus Christ came about: His mother Mary . . . was found to be with child through the Holy Spirit . . . But he had no union with her until she gave birth to a son. And he gave him the name Jesus” (Matt. 1:18,25), and “After Jesus was born in Bethlehem in Judea, during the time of King Herod, Magi from the east came to Jerusalem” (Matt. 2:1). 3. The Bible is the most widely printed and published book in the world. Every time we reread a passage, new ideas and cross-references to other texts come to mind. This leads us come to an important conclusion: the Bible is the only divine book. Its truth has been guaranteed and authorized by God. How Do I Start My Journey with Christ? Our purpose in these pages has been to encourage a thoughtful, daily heart to heart relationship with God. But some of you may not yet know God in a personal way through His Son. Family and church connections are an important part of religious life. But these experiences don’t make a person a Christian. First, we must admit that we are sinners and can not save ourselves. The Bible tells us that “all have sinned and fall short of the glory of God” (Rom. 3:23). Second, we need to recognize the seriousness of our sin. The Bible says that “The wages of sin is death, but the gift of God is eternal life in Christ Jesus our Lord” (Rom 6:23). Third, we must believe that Jesus Christ died for you on the cross, was buried, and rose from the dead. This means that Jesus Christ, who never did anything wrong, gave His own life on the cross so that the penalty of sin could be paid and His righteousness applied to us (2 Cor. 5:21). Fourth, We need to confess and receive Him as Savior and Lord. “If you declare with your mouth, Jesus is Lord, and believe in your heart that God raised him from the dead, you will be saved” (Rom 10:9). Are you ready to make that decision? If you are, you can go to Jesus in prayer and tell Him your desire to receive forgiveness for sin and the start of an eternal relationship with Him. Did you pray that prayer? If you did, you can have the assurance that Christ is in your life. The Apostle John wrote, “These things I have written to you who believe in the name of the Son of God, that you may know that you have eternal life” (I Jn. 5:13). “What’s in a name?” Shakespeare’s Romeo and Juliet made this question famous. A name is important. From the day of our birth, our parents use our name to link us to their own preferences and values. The significance of a name was particularly true in Bible times. In both Old and New Testaments, names were used to reflect personal experience or express or influence character. Jacob, which means “supplanter”, The name Naomi means “delightful one”, Samuel, which means “heard of God” and Barnabas, which means “son of encouragement”. So names are important to the people of the Bible. But nowhere is this more significant than in the one who, according to the New Testament, has a name that means Savior. In Matthew 1:21, we read: She will bring forth a Son, and you shall call His name Jesus, for He will save His people from their sins. It is the name by which we must be saved. “Nor is there salvation in any other, for there is no other name under heaven given among men by which we must be saved” (Acts 4:12). It is the name at which, one day in the future, every knee shall bow. “That at the name of Jesus every knee should bow, of those in heaven, and of those on earth, and of those under the earth, and that every tongue should confess that Jesus Christ is Lord, to the glory of God the father” (Phil. 2:10-11). Wonderful Counselor, Mighty God, Everlasting Father and Prince of Peace.“Unto us a Child is born, unto us a Son is given; and the government will be upon His shoulder. And His name will be called Wonderful Counselor, Mighty God, Everlasting Father, Prince of Peace” (Isaiah 9:6). By discovering that He is a person of many names, we will be led deeper into an understanding of who He is and why He deserves our trust. Reflections: What does each of Jesus’ names mean to you personally? In this step by step guide, we will show you how to install PrayBox+ Plugin. First, you need to have the plugin file (which will be a zip file). Next, you need to go to WordPress admin area and visit Plugins » Add New. There is one step many people seem to overlook when upgrading to the premium version of a plugin – uninstalling the free version! PrayBox plugin uses mail function in PHP to send emails. This mail function often does not work as expected due to a number of reasons. The most common reason is because your hosting company may have strict email configuration or they have disabled it entirely to avoid abuse. In either case, your notifications or emails generated by PrayBox will not be delivered. Let’s take a look at an example: Assume that your admin email address in WordPress is yourusername@gmail.com and your site’s domain name is yoursite.com. Emails sent by WordPress will be sent from an email address like WordPress@yoursite.com. This is not an actual email address. Many spam filters will mark it as spam and sometimes the email will not even leave your web host before its been discarded as abuse. That’s why we recommend using Postman SMTP plugin to send emails in WordPress. SMTP (Simple Mail Transfer Protocol) is the industry standard for sending emails. Setting up email can be a little bit difficult for new WordPress users. However, keep in mind that you will only have to do this once. Let’s take a look at how to setup Postman SMTP services to send out WordPress emails. First thing you need to do is install and activate Postman SMTP Mailer/ Email Log plugin. Upon activation, you need to visit Settings » Postman SMTP page to configure the plugin settings. Simply click on Start the Wizard button to get started. You will be asked if you would like to import settings from another plugin. Click on next button to continue. Next you need to enter your Gmail email address and sender name. Click on the next button to proceed. The plugin will now try to figure out your SMTP server. In this case, it will show smtp.gmail.com, click on the next button to continue. The plugin will now run some tests and will show you the best possible settings. 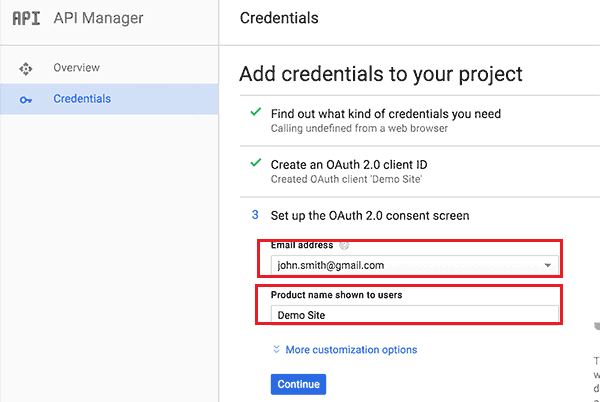 For Gmail SMTP, the recommended settings are SMTP-STARTTLS with OAuth 2.0 authentication. Click on the next button to continue and the plugin will show you two URLs and will ask you to provide Client ID and Client Secret. You will also find the link to Google Developers Console Gmail Wizard, which will take you to a step by step wizard for generating those API keys. Once you open the wizard, you will be asked to login with your Google account. Use your Gmail address (the same email address that you are configuring Postman with) as the Google account to proceed. Next, you will be asked to create a new project. Simply click on the continue button. 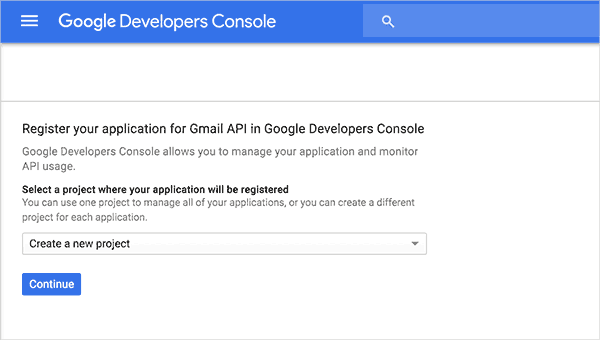 Google Developer Console will now create a project for you with the Gmail API. You will see a message that a project has been created with the Gmail API enabled. Click on ‘What credentials do I need?’ button to continue. You will now reach the ‘Create an OAuth 2.0 client ID’ step of the wizard. Provide a name, this could be your website title or anything you want. Click on the ‘Create Client ID’ button to proceed. You will be now asked to setup OAuth screen. Simply select your gmail address and provide a name for the App that is accessing your Gmail Account. In this case, it will be your own website. After that click on the continue button. 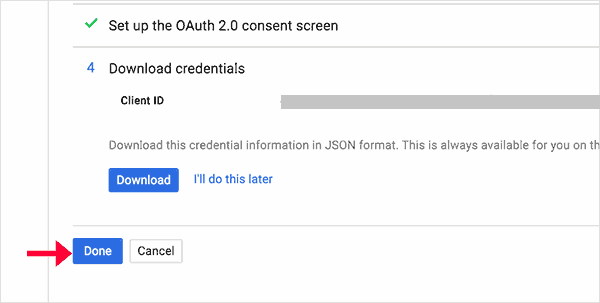 Your Gmail API is now all set with OAuth authentication enabled for it. You need to click on the Done button. This will take you to your API credentials list. 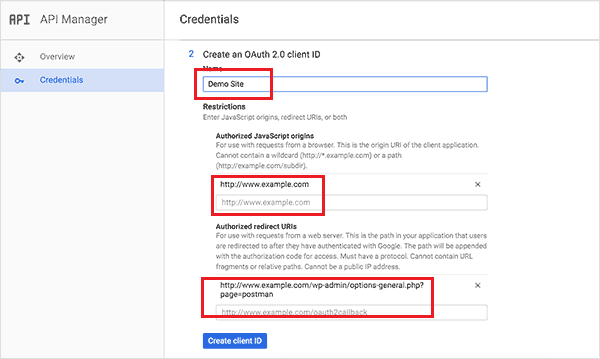 On this page page, you will see the client IDs that you have created to access your Gmail API. Click on the Name of your website or project client. You will get to see your client ID and client secret keys. You need to copy those keys and paste them in the Postman plugin page on your WordPress site. After that click on the next button to continue. You have successfully finished the Postman plugin’s setup wizard. Click on the finish button to exit the wizard. Now, you need to grant your WordPress site permission to access your Gmail account. Simply click on the ‘Grant permission with Google’ link on the Postman plugin page in your WordPress site. This will take you to your Google account. You need to click on the Allow button to give your website access to your Gmail account. You can now send yourself a test email to see if everything is working fine. We hope this article helped you learn how to use Postman SMTP to send WordPress emails.